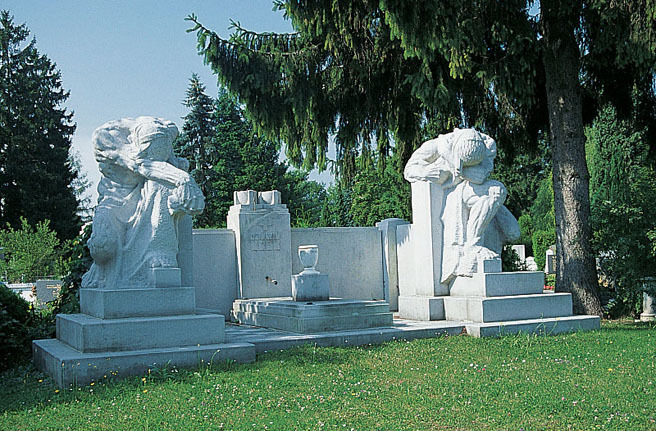 Žale, which is an old Slavic word for a cemetery, is the main cemetery of the city of Ljubljana. It was founded in 1906 and is still in use today. In the years 1938/40 its design was made by architect Jože Plečnik (1872-1957), who was undoubtedly the most important figure in the history of Slovene architecture. Behind a symmetrical entry building, which is a combination of two wings joined by a peristyle, is a park with individual chapels and signs. The central alley ends with the funeral room. Beside this exceptional complex of Plečnik, the importance of the cemetery lies also in the tombs and tombstones of notable Slovenian personalities, which are works of the most important Slovenian artists. Through the cemetery runs the Pathway of Memory and Companionship, in memory of a barbed wire fence, which surrounded the city from 1942 until 1945. After the war it was developed into the 30 km track around the city with the aim to provide a green recreational facility. The new part of the cemetery was designed in 1988 by architect Marko Mušič. Design for this city of the dead shows his respect for Plečnik's work and his orientation towards classical tradition of antiquity and ancient Egypt. Cemetery Žale is of great significance to Slovenian culture. At the same time its high artistic quality presents it also as unique among European cemeteries. Oglejte si Žale Cemetery (Ljubljana, Slovenia) na večjem zemljevidu.